Good evening and welcome to our live chat. The Daily News is hosting a community discussion with our panel of experts about the future of Florida's famous beaches, proposals to change how beaches are managed and ways to keep the states' shores healthy. The forum and live stream will begin at 6 p.m. You can read our Shrinking Shores series at naplesnews.com/sand. Reporter Eric Staats, who worked on the Shrinking Shores project with Ryan Mills, will be joining us in the chat shortly. You can ask questions for him or for our panel and we will do our best to get them answered. Naples Daily NewsEvery year, Florida loses more of its beaches. Hello everyone. Welcome. I'm Eric Staats, one of the reporters who worked on the "Shrinking Shores" project. Thanks for joining us. About 100 people are here in the Naples Daily News studio and we're looking forward to your contributions. Our panelists are state Rep. Ben Albritton, Collier County coastal zone manager Gary McAlpin and Naples Vice Mayor Linda Penniman. What’s the most important thing Floridians should know about the state’s beaches and what is the biggest threat facing them? McAlpin: "Beaches are the hook that get tourists to come to Collier County." Penniman: More tourist tax in Collier County is spent on tourism promotion than on the county's beaches. Next question: Florida’s beaches draw millions of people from around the world to vacation and live on the coast. As such, the state has permitted its coastline to develop rapidly. Do you have concerns about the amount of development along the beaches? Why or why not? Penniman: The FDE approved over 41,000 permits in the state of Florida over what were already critically eroded beaches. Albritton: Awareness about beaches important to "turn the rudder" in Tallahassee on beach funding. McAlpin: Doesn't see any change coming to coastal construction policies in Collier County. Albritton: Coastal construction a double-edged sword, raising property tax revenues but also increasing challenge of beach management. "Finding a balance there is the right to do," he said. Follow-up: Coastal engineers say we should be retreating from the beaches. Where do you stand on that and is that even realistic for a place like Collier County? shoreline in Collier County," he said. Next question: Florida’s beaches generate tens of billions of dollars in economic activity and billions in state sales tax revenue. For every dollar beaches produce in state tax revenue, the state sends a penny back to local communities to help renourish beaches. Is that enough? 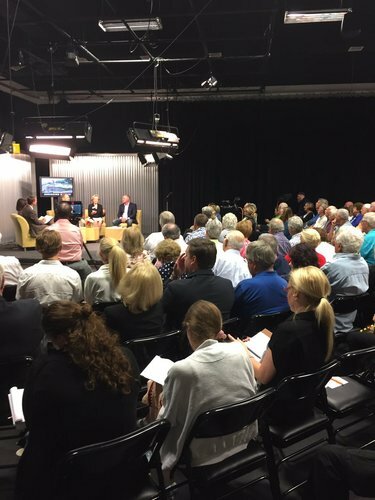 Tune in now to naplesnews.com to watch the Naples Daily News community forum on "Shrinking Shores." McAlpin asks Albritton to help rework state's ranking system for beach renourishment funding. Albritton: "Taking a look at the ranking system makes sense to me. I'm open to that discussion." Follow up: Rep. Albritton introduced legislation last year that would have changed how we rank our beach projects. Asked to talk a little about what happened with that bill and what he'd like to tackle with that ranking system in the future. Albritton bill, which failed, would have added economic return criteria to ranking system. Naples Daily NewsHurricane matthew exposed weaknesses in the state's beach renourishment program that advocates say must be fixed. Albritton said bill failed because it was a significant change that takes time to accomplish. "We're contemplating a new direction" for the upcoming session, he said. Follow up: Gary McAlpin has said Collier County is disadvantaged for beach projects because there's no Army Corps of Engineers project here. What would he like to see to change the ranking system? McAlpin on the ranking of beach projects: A half a point or a point can make a huge difference whether you get the money or not. But we also need to make the pot bigger. McAlpin cites "bureaucratic resistance" to change in the beach program. If you have a question for the panel, please share it with us and we'll try to get an answer. Next question: In counties around the state, some inland residents don’t feel it’s their responsibility to pay for beach renourishment. The same debate between inland and coastal counties plays out in the state Legislature. What has been your experience in trying to convince inland legislators of the value of healthy beaches? Penniman asks Albritton to support construction of mangrove islands to blunt storm surge; Albritton says he would consider it but not sure of implications statewide. Albritton says he's never had an inland legislator tell him they don't support beaches but they want support for their infrastructure projects in return. "That's the playing ground I have to operate in," he said. Finding money for beaches in state budget is a "zero-sum game" that requires coalition building, Albritton said. Follow up question: What we've seen historically is that after a busy storm season is when the money for beach projects go up. Is there a number for beach projects you're aiming for next year after this big hurricane season?